One entry simply says: “Thank you”. Some of the entries in the book of condolences. HUNDREDS OF PEOPLE have signed the book of condolences for poet Seamus Heaney in Dublin’s Mansion House. The book, which was opened by Lord Mayor Óisín Quinn on Monday morning, has attracted many people paying their last respects to the popular Nobel laureate. One comment read: “Thank you – thank you”, while another simply said: “You will be missed so much”. 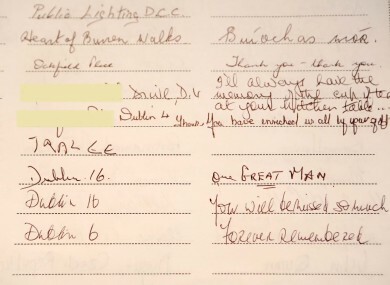 Another person wrote: “One GREAT man”. A spokesperson for the Lord Mayor’s Office said the book will remain open until 5pm on Wednesday. Books of condolences have also been opened around the country, including in Dún Laoghaire, Sligo and Galway, as well as in the City Hall in Belfast and the Guildhall in Derry. Heaney’s funeral was held in Dublin yesterday before his burial in his native Derry. Email “Photos: Hundreds sign book of condolences for Seamus Heaney in Dublin”. Feedback on “Photos: Hundreds sign book of condolences for Seamus Heaney in Dublin”.